/CNW/ - Inspired by Iceland, known for its quirky campaigns and warm humour, has today launched a unique challenge via the 'Inspired By Iceland' website for tourists around the world. Harnessing the island's language, which is notoriously difficult to learn, Inspired by Iceland has released what it claims to be 'The Hardest Karaoke Song in the World' and are encouraging people to watch it and have a go themselves. 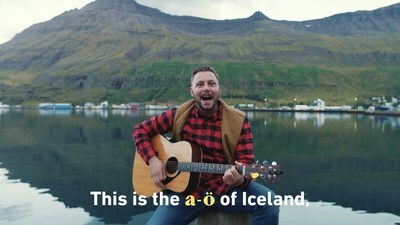 The video has been released as part of Iceland's new marketing initiative the A-Ö of Iceland, the Icelandic equivalent of an A-Z guide, which uses the 32 letters of the Icelandic alphabet, ending in 'Ö'. The aim of the initiative is to harness the uniqueness of the Icelandic language to highlight the diversity and breadth of Iceland and to encourage visitors to go further and learn more. "We are always looking for ingenious ways to inspire visitors to engage with more aspects of our country and our seven regions. We have launched our new A-Ö campaign to explore our island using our unique language and alphabet. We know Icelandic is difficult to pronounce but through our karaoke film we wanted to encourage visitors to have a go and also show the world we are not afraid to laugh along." The first few tourists to give the video a go have been filmed in Iceland to hilarious results: https://youtu.be/XR9bTjB10zU and anyone up for the challenge to try out the song can find it on the Inspired by Iceland website and the Inspired by Iceland youtube channel with the country encouraging viewers to send in their attempts. Visitors to the website can also take part in the 'regional quiz' to win an adventure trip to Iceland and learn more about the country's seven special regions.